On April 25th, Fr. Fredric Abiera met with Brother Peter Tripp, FSC, an associate of the Risk Management Services of the Christian Brothers. Bro. Tripp gave Fr. Fredric updates of the account of the Province and also reminded him of the many services provided by the Christian Brothers Services. The meeting was very fruitful and a wonderful opportunity for Fr. Fredric to have a greater understanding of how the company works. After the meeting, Fr. Fredric and Bro. Peter enjoyed a delicious and ample meal. Fr. Michael Stechmann and Deacon Ascencion Esqueda at the Sunday evening Mass at Cristo Rey when Elva Amargos celebrated her 101st birthday with great enthusiasm in the church. One of our young parishioners who always sits with his family in the front row and sings his heart out was silently counting with his fingers to see if he could reach 101. It was too funny to watch him. At the end of Mass he was invited him to come forward to wish Elva a Happy Birthday and the church erupted with loud applause and a hearty singing of Las Mañanitas. FR. MICHAEL STECHMANN was elected to the Board of Directors of QueensCare Health Centers in July, 2017, serving on the Executive Committee with a total of 16 members. As a faith-based organization, QueensCare strives to provide accessible healthcare for uninsured and low-income individuals and families residing in Los Angeles County through a system of health care clinics and community outreach program. The roots of the organization are traced back to the Queen of Angels Catholic Hospital which, at the invitation of the State of California, merged with the troubled Hollywood Presbyterian Medical Center. At its foundation as a nonprofit charity almost twenty years ago, the structure and funding restrictions were determined by the Attorney General of the State of California. (A current on-going effort at this time is working with the Attorney General to expand services in other areas, especially outside of the existing zip-codes and to assist the growing homeless situation in the Los Angeles area.) There is also a system of grant distribution through the Charitable Division which supplements the healthcare services. All meetings are held at the Federal Reserve Building in downtown Los Angeles where the headquarters are located. Board of Directors for QueensCare Health Centers at a recent meeting. PARISH VOLUNTEERS were invited to a dinner in the parish hall in order to extend our gratitude for their generous service to Cristo Rey. A group of 100 parishioners responded to the invitation and represented catechists, choir members, lectors, Ministers of the Eucharist, ushers and various others.) Following the meal there was a raffle with a variety of prizes and special entertainment provided by our 16 year old mariachi singer, Brian Munoz. Everyone also received a note of appreciation from Fr. Michael Stechmann and the community, along with a DVD, “Saint Augustine: A Voice for All Generations” which was well received because it is able to be viewed in either English or Spanish languages. NOVEMBER AND DECEMBER were a buzz of activity with three novenas (Cristo Rey, Our Lady of Guadalupe and Las Posadas). Good weather for the feast of Cristo Rey brought a good crowd for the traditional street procession. The unusually warm weather in December found large numbers present for Las Mañanitas. We are especially grateful for the Guadalupanas who provided the mariachi for the Mass and afterwards during the celebration in the parish hall. Twenty-seven nights of special celebration can be daunting, however, these are important times for the parishioners and this was evident in their generous response in the Masses, the presentation of flowers and especially for Las Posadas. The sign-up list for the novena participants was made available in October and each novena had more than enough families for each evening. The response for Las Posadas was especially noticeable, including families who had moved out of the area years ago but still have connections here. Deacon Ascencion Esqueda again assumed responsibility for the prayers, procession and gathering in the parish hall. We made every effort to limit the number of piñatas but we still had as many as six each evening – much to the delight of the young and old. Deacon Ascencion and Father Michael monitor excited children. CLASSES RESUMED after the Christmas vacation and it was also time complete “Safeguard the Children” requirements as mandated by the U.S. Conference of Catholic Bishops. Parent meetings were held to apprise them of the planned sessions with each class regarding safe touch and they were asked at this time to sign permission slips for the course. Virtus Re-certification was held for parish volunteers on January 13 with Noel Lopez from the Archdiocese serving as facilitator and he also returned for a successful Pre-audit visit was held in February. The paperwork required to remain in compliance with the U.S. Bishops guidelines is becoming increasingly complicated. 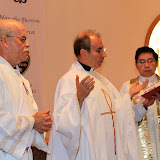 Father Michael, Noel Lopez and Deacon Ascencion during the recent Virtus Re-certification. Parish volunteers proudly display their VIRTUS certificates. A SERIES OF MEETINGS for pastors have been held to initiate a unified program throughout the Archdiocese for payroll working with Automatic Data Processing (ADP). The majority of the parishes have already been using the services of ADP for payroll and the switch to an Archdiocesan-wide program has resulted in numerous meetings, more detailed reporting and expenses for the parishes. Fr. Michael has also had to attend several meetings to hear plans by the Archbishop for a Capital Campaign to begin later this year in pilot parishes and eventually to include all parishes. This is also a frequent agenda item for regional deanery meetings. ON FEBRUARY 1, Fr. Michael Stechmann was present for the dedication of the Mobile Dental Unit at Esperanza School in Los Angeles. This is the largest mobile unit in the United States and was completely funded through Queenscare as part of the annual community health program and will be serving low-income students at 11 public and Catholic schools. Mobile Dental Unit funded by Queenscare. Fr. Michael Stechmann joins members of the Board of Directors at the dedication ceremonies. Father Michael and Sister Ruth guiding students on a tour. CRISTO REY HOSTED the monthly meeting of the Archdiocesan Council of Catholic Women (ACCW) on February 12. The group from each pastoral region meets monthly in various parishes and this was their second visit to our parish. Dominican Sister Catherine Marie Bazar spoke to them about her ministry in the Los Angeles County Jail and following Mass, they continued with a business meeting and luncheon. Board members of ACCW at Cristo Rey. IMMIGRATION FEARS that have gripped much of the nation are especially prevalent in the Los Angeles area. Deacon Ascencion Esqueda had previously participated in regional sessions and local meetings to inform parishioners of their rights. As a follow-up, Fr. Michael Stechmann invited Rafael Torres, an immigration attorney, to present a workshop in the parish hall on February 10 and a group of 100 parishioners participated. In addition to learning about current development with laws and procedures, Mr. Torres was able to answer individual questions and schedule private meetings with our parishioners. The gathering lasted for almost four hours and so many were delighted to hear that there are some simple solutions to specific immigration cases. Our parishioners were especially grateful for the opportunity to meet in a safe environment and to know that their confidentiality would be respected. CONFIRMATION PEER LEADERS from Cristo Rey and St. Thomas More Parish in Alhambra gathered in our parish hall on February 17 for a day-long retreat. Fr. Jorge Valdivia gave a presentation to the group and our catechists also spoke on leadership and guided them through group discussions. They closed the day in church with Eucharistic adoration, followed by a festive meal prepared by one of our parishioners who is a caterer for many functions in Hollywood. Fr. Jorge Valdivia addressing Confirmation students. Confirmation Peer Leaders gathered at Cristo Rey. THE ANNUAL APPEAL for the Archdiocese of Los Angeles, Together in Mission, was held recently and Cristo Rey once again exceeded the mandatory goal on the first weekend with one-time gifts and promissory pledges. Frs. Michael Stechmann and Jorge Valdivia divided up the presentations on this year’s theme, “Let us Love” and the appeal process during Masses on two consecutive weekends. Letters of gratitude have been received by the Archdiocese for the continued generosity of our parishioners and separate letters have also been received from the Mission Office of the Archdiocese for the support of missionary endeavors. FR. JORGE VALDIVIA continues meeting with couples for marriage counseling and meets in homes and the parish with members of the Movimiento Familiar Cristiano. He recently attended an appreciation dinner for spiritual advisors that was sponsored by various parish groups. He is involved with El Sembrador Ministries located in Chatsworth, CA and attends weekly meetings at the Centro de “Fe y Vida” in nearby Glendale. The founder of this group was formerly associated with El Sembrador and their focus is on spiritual and emotional healing. He has participated in evenings of “Inner Healing” with the group, encouraging members of the parish to also participate. Members of this group and others come to the parish to meet with him for individual counseling and crisis intervention. Fr. Jose Valdivia giving a presentation to women who meet weekly at Centro Fe y Vida. 40 Augustinian Recollect religious of the United States convened by the Prior General and Provincials meet in assembly in Oxnard, California. Arriving from the communities of the states of New York, New Jersey, California, New Mexico, and Texas, 40 religious came to Oxnard to meet in an assembly, in which the members of the commission for the union of the provinces also participated. Currently, 50 Augustinian Recollects from the provinces of St. Augustine and St. Nicholas of Tolentine reside in the United States. In addition, an Augustinian Recollect religious of the province of St. Ezekiel Moreno resides temporarily in the same country. Some could not go because they were out of the country and others because of travel limitations. Most of the 13 communities in the United States attend parish ministries; even communities that do not run a parish collaborate in that ministry in surrounding parishes. On the morning of January 17, the Assembly began with a greeting and presentation by the Prior General, Miguel Miró. After welcoming all the participants, he recalled the purpose of the assembly. All the activities since the last General Chapter have a common purpose: a personal, communitarian, and pastoral conversion. He invited us to see the action of God in daily life and in the brothers, and respond to the challenge of the times in which we are living. He also recalled the steps taken in the process of the union of the provinces promoted by the Project of Life and Mission of the Order. He underlined the will of the general and provincial councils and of the Commission for the union of the provinces as transparency, and complete and continuous exchange of information. He referred to the three verbs with which Pope Francis in the encyclical Evangelii Gaudium and in the message to young people proposed in order to make decisions: to recognize, to interpret, and to choose, and his analysis of what happens in those who focus their lives only on their own interests. And he concluded by asking for the intercession of St. Augustine, of the saints of the Order, and of the Virgin of Consolation. Sergio Sánchez, echoing the desire to have complete communication, updated all the participants in the assembly about everything that has been done up to the present by the Commission for the union of the provinces and councils to comply with the process ordered by the General Chapter. The official letters sent, the meetings held in the commission--including that of the councils of both provinces before the commission was constituted--, the creation of working groups, and the designation of responsibilities in the fields of youth ministry and vocations, initial and ongoing formation, spirituality, apostolate, economy, etc. Also, an outline of the steps of the process planned until the provincial chapter. Regarding what has already been done, Sergio Sánchez reviewed all the official letters sent to the religious from the councils and from the Commission for the union of the provinces. In this outline is the elaboration of the Project of Life and Mission for the province and, as a basic starting point, restructuring for revitalization. The present assembly will be, he said, a time for contributions for the discernment of how to better organize our life, our communities, and our province. He invited everyone to live with interest the preparation for the provincial chapter, because its fruits depend on what is contributed to it, since "what comes from the chapter is what has gone into the chapter". The working groups then explained what has been done so far and what remains pending until the provincial chapter. We looked with optimism at the impulse given to the pastoral care of vocations and young people, while at the same time recognizing the limitations to carrying out some initiatives of commitment by the local coordinators and each one of the religious. At this moment two aspirants have started their community experience in Oxnard to discern their vocation, and several more candidates have also applied for admission. The implementation of JARs in the ministries is a challenge. Regarding initial formation, some of the religious of the United States have participated in formation meetings in Mexico, visited the house of formation of the professed, and have maintained communication with the president of the formation secretariat. One sees as a challenge the effective option of the formators for the Augustinian Recollect formation itinerary. The activities of permanent formation and spirituality have been more pending; it is proposed to carry out some days for the promoters of the Augustinian spiritual exercises, and prayer workshops as a way of initiating the establishment of a center of Augustinian Recollect spirituality in the United States. The numerous and active presence of the Secular Augustinian Recollect Fraternities in some ministries is recognized, and, therefore, their work of enriching those ministries with their own spirituality. In addition, the apostolate group insists on opting for quality in pastoral care and in seeking communal work for communication and mutual support. The economy group also reported on what was done in the exchange of information on the state of the economies of both provinces. The last report [on properties] dealt in particular with the possible closure of the community of [St. Cloud in] West Orange, New Jersey or Tagaste Monastery in Suffern, New York. The Prior General and Provincial Priors took the floor with information about the guidelines for the elaboration of the Life and Mission Project. The last general chapter has already definitively indicated the strategy to define what the Order wanted to assume for this specific time: how it sees itself, how it understands its mission, and what decisions it considered should be carried out. In all cases there has been an effort to make these goals concrete and evaluable, indicating a date of compliance and of responsibility. Already in the previous administration the provinces and most of the communities had elaborated their project of life and mission. At this moment the province will have to assume the guidelines marked by the Order and once again re-elaborate its own project in the chapter. Taking into account the historical moment of union of the two provinces, certain necessary elements such as availability, mobility, and sense of belonging are highlighted. From the beginning of the Assembly three lines of action were established to achieve greater fruit: communicate, get involved and commit. An effort was made to COMMUNICATE to all the religious everything that had been done and all the projects in progress; continuous spaces for dialogue were opened so that in the meetings whoever wished to do so could express their opinion, speak about their concerns, or present their contributions. In addition there was also a time for getting to know all the participants in a more personal dialogue. All were also asked to GET INVOLVED in the assembly by taking an interest in the issues that were discussed, participating actively, and responding to the presentations that were made, as directed by the Prior Provincial of the Province of St. Augustine, Michael Rafferty. Finally, the effectiveness of the assembly for the time that is still remaining before the next provincial chapter, and in line with the Project of Life and Mission, depends on the commitments of all. Therefore, as a synthesis of what was worked on during the two days, Sergio Sanchez presented some COMMITMENTS to fulfill: the first is to hold community meetings in which, in addition to promoting communication and intercommunity dialogue and complying with what the Constitutions of the Order invite us to do, the Project of life and mission of the Order will be studied, as well as the draft of the Provincial Directory that will be approved in the chapter, etc. The second commitment will constitute a vocational guidance team in each ministry. The third, to organize study days to know the content and application of the spiritual exercises and prayer workshops. Also, to send from the provincial secretaries all the informative documents. Finally, to send news of the activities of the communities and to collaborate in the translation into English of those items that appear on the web page of the Province. Everything will be evaluated and sent to the provincial secretary. The meetings in the large chapel of the community in Oxnard for common recitation of the Liturgy of the Hours, for community prayer, and especially for the concelebrated Eucharist were particularly important moments. In the Eucharist, the assembly members were accompanied by some faithful close to the Augustinian Recollects who regularly assisted at the daily mass. The Masses were celebrated by the prior general and by the priors provincial.